New Years in San Miguel de Allende Motorcycle TourRing in the New Year a lo Mexicano! Tour starts and ends in McAllen, Texas. You will find yourself on excellent paved roads throughout this tour. Ideally suited for any kind of motorcycle, roads are a mix of fast moving but very open highways, sporting rural mountain roads and rolling lush tropics. This is a great ride for couples and singles. You are encouraged to bring your own motorcycle. Rentals available. Please book early in order that we might obtain the best accommodations during this peak holiday period. MotoDiscovery is the Mexico expert. We started out in 1981 running tours to Mexico under the name of Pancho Villa Moto-tours. Since then we have hosted many thousands of riders traveling in every area of Mexico. When it comes to Mexico, riding with MotoDiscovery means you are riding with the best. We love San Miguel de Allende and we are not alone. There is a good reason why expats consider this the true gem of México, with its old colonial charm, cobblestone streets, and a blossoming social life centered on music, the arts and a lifestyle that is far from the rat race. This is the Mexico we all love. The ride is memorable especially through the mountainous Huasteca region known as the Sierra Gorda. Riding the Ruta de Padre Junipero Serra named for the chain of 18th-century missions and Moorish complexes constructed by this adventurous Franciscan you will witness these beautiful structures, just a few of many he built all the way to California. The Fiesta bringing in the new year begins with a fantastic dinner, then we make our way to the Jardin, the plaza where fireworks, music and lively celebrations run through the night. Our accommodations are centrally located near the plaza allowing for easy walking and access to the village. It is hidden away in a lush tropical jungle on the edge of a cloud forest and the Unesco Biosphere Reserve. The odd yet enchanting concrete art of the late eccentric artist and poet English nobleman, Edward James, meanders for acres and begs to be explored. The service. We can’t stress enough how important this is. Our knowledge of Mexico is unmatched, our bilingual staff the most accommodating. You will appreciate the pleasures of being able to enjoy your ride knowing you are with people who care. That is the MotoDiscovery way. Is this a good time to go to Mexico? There is never a bad time to go to Mexico as far as we are concerned. There is a little risk of colder weather the first and last day, your most northern points. Once you get beyond the border, temperatures are mild. Other than a New Years fiesta, what can I expect? This tour is a version of one of our most popular road tours, the Colonial. Flavors of Old Spain are abundant. The ride across the Huasteca region known as the Sierra Gorda is one of Mexico’s best touring roads. This is just a great ride balanced with all we love about Old Mexico. To provide better quality service and permit flexibility, the San Miguel de Allende New Year’s Tour is limited to ten bikes plus staff. The exception is private, custom tours where the decision is that of the organizer. Please book early as this is a popular sellout. What is so special about San Miguel de Allende? Haven’t you heard? It was voted as the world's greatest city by Conde’Nast Traveler in the 26th Annual Readers Choice Award. Its cobblestone streets, Colonial heritage, and emerging hip style make this the perfect place to bring in the New Year. We’ve been riding to San Miguel de Allende for over 35 years. What about crossing the border. Is it difficult? Not when you ride with MotoDiscovery. 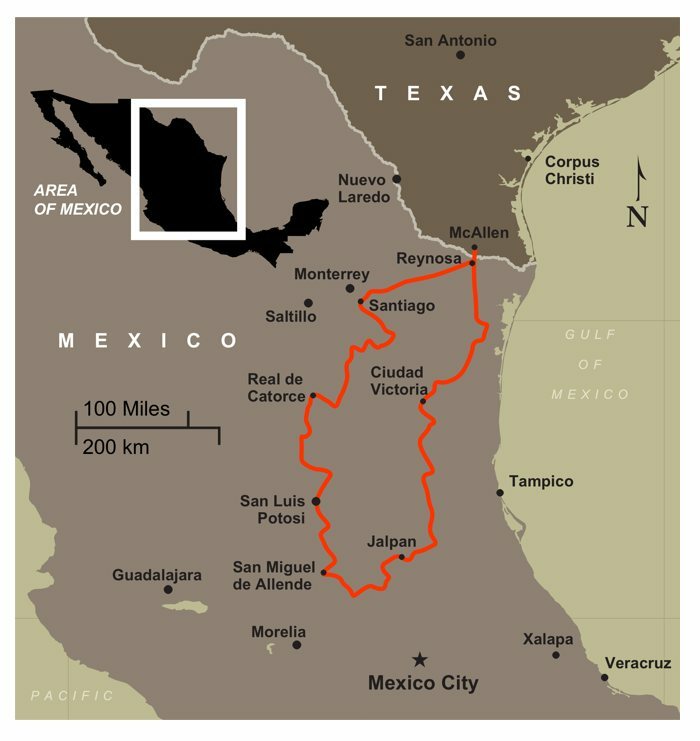 We’ve hosted more motorcyclists from more corners of the globe on travels through Mexico than any other company. Mexico is where we started. We’ll manage all the border crossing formalities for you. You’ll need a passport and an original title or registration for your motorcycle, a credit card, and a drivers license. That’s it! We’ve been riding there for well over three decades without incident. We’ve never had a motorcycle stolen! Yes, the country has a recent history of territorial wars between drug cartels, but tourists are not the targets. In fact, they go out of their way to avoid that kind of exposure. With over 12 million visitors last year alone, we’d say Mexico, while there are risks wherever you go, is safe. We wouldn’t go there if we thought otherwise. Are rentals available? / Can I bring my own motorcycle? Yes and yes. You are welcome to ride your own bike or rent one. Contact MotoDiscovery for rental options. As far as bringing your own bike, we’ll advise you on how to obtain inexpensive insurance and prepare your motorcycle for the journey. Is this a good couple's ride? Don’t even think about leaving your loved ones at home. Yes. This is an ideal couple's ride with romantic accommodations, exceptional dining and plenty of fiesta. And it is a great ride too with moderate daily distances and on pavement all the way. Do you have a luggage vehicle? Yes, a support vehicle with a staff assistant will accompany this ride. We’ll carry your luggage, have the ability to transport at least one motorcycle and have plenty of room for all the purchases you are sure to make. Now. Getting high-demand accommodations in San Miguel require advance notice. Please don’t delay.